Viking sword chape an eastern type. This is a viking sword chape of eastern type. With 'eastern type', this type of sword chape is addressed to the kind of sword chapes mainly found (south)east from Norway. Length 63 mm, width (at broadest point): 40 mm. Thick: app. 10 mm (although somewhat difficult to measure due to indention by the soil during lying in the ground for a 1000 year +. 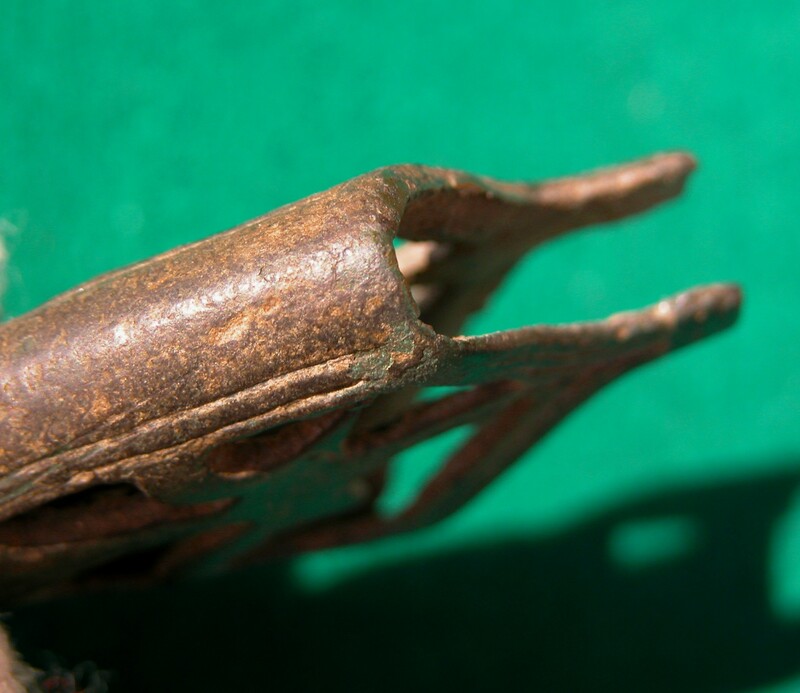 The image is a representation of a bird in bronze within a scabbard or sword chape. 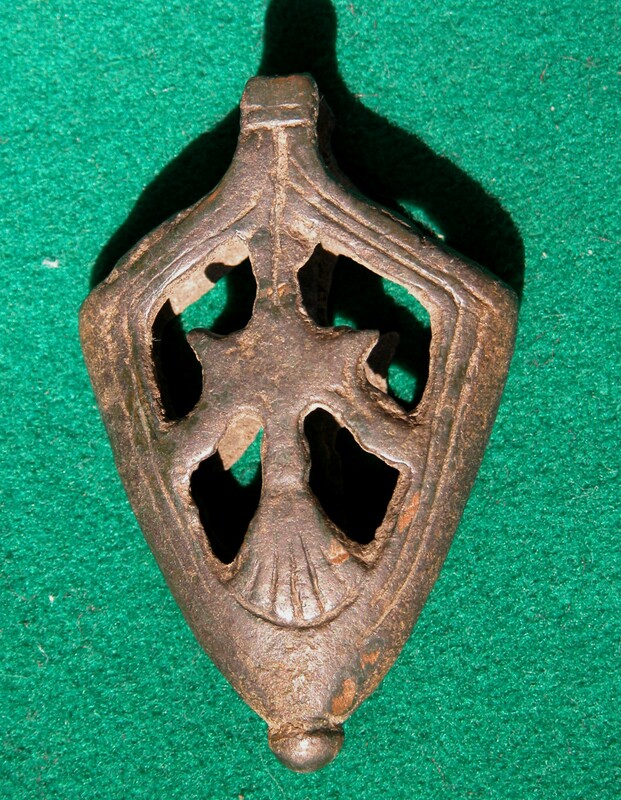 Similar motif are among the exeptional finds from the so called 'Birka excavations' wich took place between 1990 - 1995. The bird images have been identified as falcons (and not, as the salesman of this sword chape was adressing it as one of Odin's raven..). 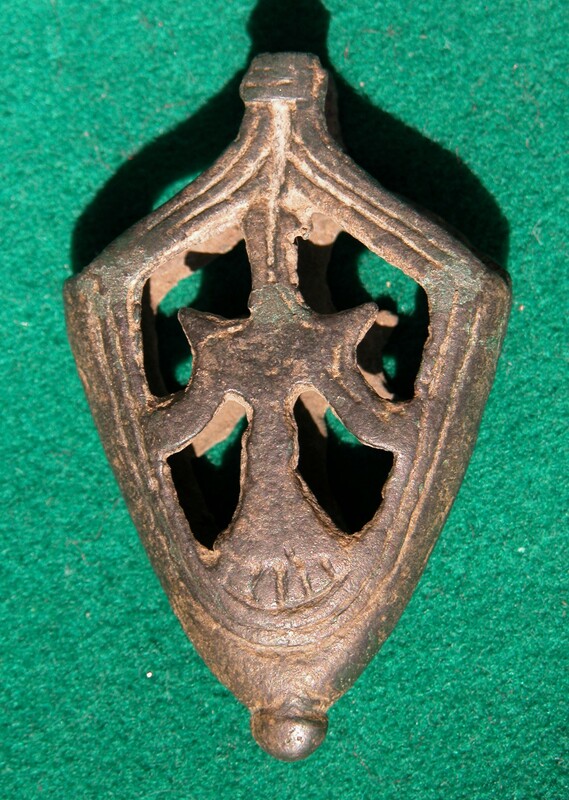 Motifs of this kind are not exclusive to scabbard chapes and are found on other artifacts from the late Viking Age such as coins, keys, and other forms of metalwork. 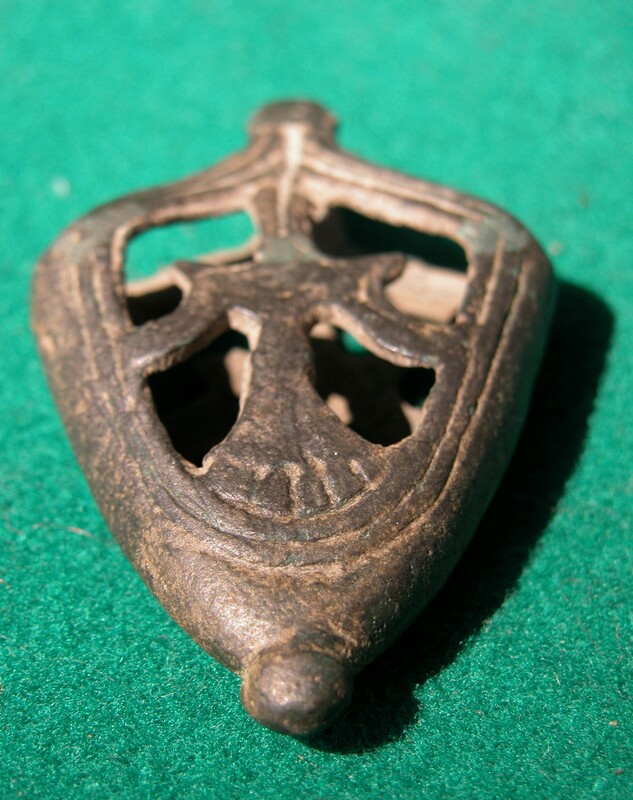 Such objects are often linked with the early principality of Russia and the motif has been interpreted as an emblem or coat of arms of Rurik's kin in Novgorod and Kiev. The motif may derive from the Edda, in wich Odin's wife, Frigg, is able to take on the guise of a falcon and fly over the world. The mythical saga motif is thought to have become combined with the aristocratic hunting falcon, producing toem images and coats of arms for one of the leading princely families of Northern Europe. 'The chape from York is a clear Falcon-category chape. This category dates to the 10th century and have mainly been found in Viking urban centres along the Eastern trade route. York is an exception, as is a find from Bretagne. 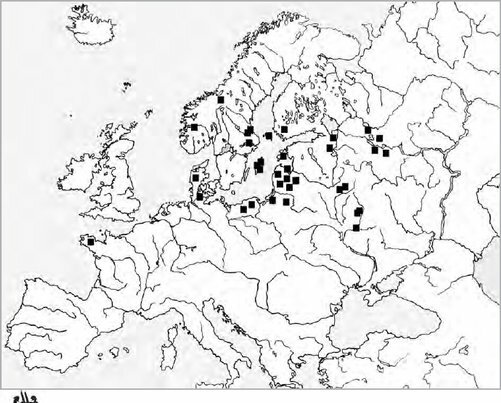 The chapes are most likely connected to warriors that participated in the network between trading centres like Birka, Staraja Ladoga, Gnezdovo, Kiev etc. They are often found in burials, which is not always the case when it comes to chapes. As chapes go they are one of the more extensive groups, but still rare in actual numbers. The motif has been called the Birka falcon as they are most numerous there. This is also the only known place of production, indicated by a mould for casting a similar chape. There was most likely production in other places but we do not know for a fact'. Also see my blog: Viking Age sword chapes, always a bit of a mystery. Björn Ambrosiani, Birka Studies Volume 5, Excavations in the Black Earth 1990 - 1995: Eastern Connections Part One: The Falcon motif (2001) p. 11-27. Peter Paulsen, Schwertortbänder der Wikingerzeit, 1953. (available every now and then in antiquarian shops). See p.17 1. Ortbänder mit germanischen Vogelmotiv and further: p. 22 - 29 Untergruppe b. 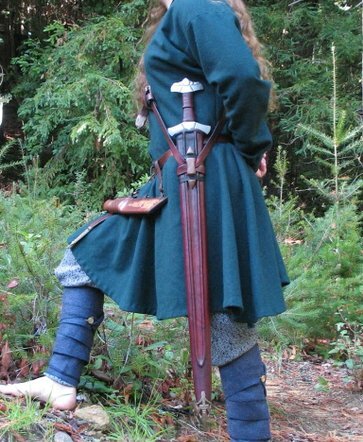 Image left: reenactor, showing how the chape was attached on the sword / scabbard. Image above: distribution pattern of this type of 'Falcon' chapes.